As an experienced educator, you have likely undertaken and published research in your discipline. But now you need to consider how to conduct research in your classroom. The video participants describe their large and small-scale questions, and their research projects that were very specific to their disciplines and their interests. You may wish to start small with your own research. Peter Felten (Elon University), Ketevan Kupatadze (Elon University), and Mathilde van der Merwe (University of Cape Town) share examples of Scholarship of Teaching and Learning Projects. 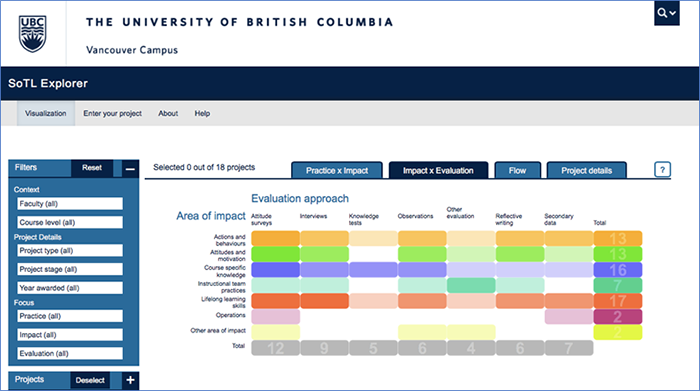 Like any research project, a SoTL project requires you to formalize your research approach. Remember, what is different about SoTL is that the focus is on improving student learning outcomes as a result of classroom practices you implement, research, assess, and report. Identifying a research problem or a challenge of practice that interests you. Developing a research question from the identified problem or challenge. Using relevant literature to inform your study. Designing a specific project and choosing an appropriate methodology. Obtaining Research Ethics Board (REB) Approval for your research. Finding support or funding to provide you time and space to conduct the research. Considering a networking and dissemination strategy to share your research and invite discussion from colleagues. Your own research experience may predispose you to follow a deductive or quantitative approach to test a current approach to the problem. Alternatively, you may wish to take a more exploratory, inductive approach using qualitative methods to illuminate new thinking about a teaching problem. It’s really up to you what approach you take. What areas of teaching practice would you like to explore? Is there a teaching practice that presents a challenge? Would you like evidence that something that you do has an impact on the way your students learn? Is there something you would like to try in your classroom and explore if it works the way you intended? Examine the links provided in this section and the SoTL Explorer. Use your SoTL Research Plan (google doc) to further refine your thinking about an area of research interest and a potential framework you are considering. Read what your colleagues are planning in their Google Docs.